Since their inception, Disk Drive Analysis (DDA) Series oscilloscopes have helped data storage design engineers improve the time to market of new products and accelerated understanding and failure analysis on existing drives. LeCroy continues that tradition with its powerful Disk Drive Analysis toolset, enabling you to capture, view, and analyze the waveshape of high-speed, complex drive signals with speed and integrity. The LeCroy X-Stream architecture integrates SiGe "digitizer on a chip" technology and a specialized high-speed streaming bus design to transfer data from the ADC to a proprietary acquisition memory. The X-Stream architecture enables disk drive engineers to quickly, easily, and accurately measure and analyze disk drive signals. The DDA 5005A is designed for signal fidelity, whole track acquisition and analysis for read channel, media noise analysis, and head parametrics with the longest acquisition memory standard. 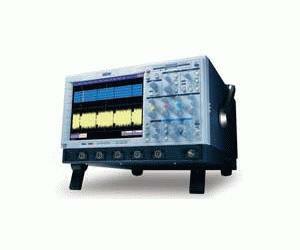 The DDA 3000 provides the same measurement capability at a lower bandwidth. This unique product has the convenience of selectable 50 Ω or 1 MΩ inputs.